To kick-off EWAC#2 we have for you on the evening of Friday October 14, starting at 17:00, a four-hour boat tour on the Rhine organized specially to enliven your spirits and hearts. Experience with us the Middle Rhine Valley at its most glorious and in the most serene and beautiful way. 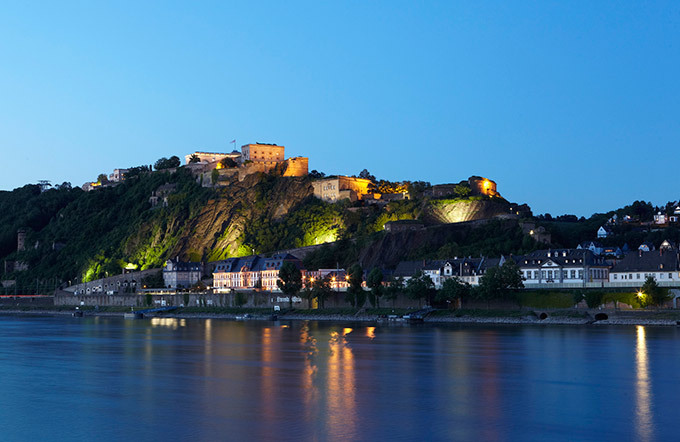 The uniqueness and beauty of the “Upper Middle Rhine Valley” was recognized by UNESCO and included in 2002 in the list of World Heritage Sites. On board awaiting you will be an unique program including delightful Indian cuisine and traditional live music. A perfect appetizer for the upcoming EWAC#2-days and certainly an unforgettable ayurvedic experience . Costs 89,00 EUR per person at presale. 99.00 EUR at the box office. 17.15 Cruise Starts Andrea Kesselheim, Boat Owner, facilitates the Boatstour - LA PALOMA runs a loop to the "Deutsches Eck" (Junction of Rhine and Mosel). Continuing the journey on the Rhine to the Loreley (depending on water level). 18.30 Classical Indian Music Ensemble from Anubhab Academy Kolkatta/Cologne - For Europeans, the music sounds mysterious, melodic leadership from the voice of Subha Ghosh, on the Tablas Debasish Bhattacharjee and Subhrodeep Pathak. A concert that takes us to India. 19.30 Dinner Buffet Delicacies from Saravanaa Bhaavan, authentic, stimulating Indian food.